GALENA PARK – One day after being sworn in as the new mayor of Galena Park, Esmeralda Moya issued orders to make sweeping changes in the administration and the way City Hall was run. In a stunning move, she fired 3 top administrators and changed the locks on the municipal building. However, reaction came immediately from the City Administrator Robert Pruett, who stated that the city charter did not give the mayor authority to fire employees, except with the consent of city council. Moya had fired Pruett, City Attorney Jim DeFoyd, and demoted Police Chief Jonathan Rader. Monday’s Council meeting was called to try to resolve the actions of the mayor that Pruett deemed illegal, but an executive session scheduled for 4:00 p.m. was boycotted by Moya, who claimed the agenda was not correct. Immediately after, the meeting was reconvened in public session, with all parties present, including an outside attorney Jim Hightower, whom the council had hired to advise them on the legal interpretation of the city charter. Hightower, of the firm Olsen and Olsen, gave his opinion on the charter, and said that the mayor does not have “unilateral” authority to fire employees, nor to change locks in the building. After hearing this legal opinion, Councilman Simms took charge of the meeting. He moved and it was passed unanimously that he had the authority to sign checks, and that the mayor did not have the right to fire the employees unilaterally, and they voted to rescind the firings. 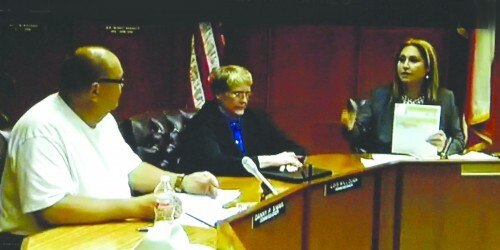 Moya said she objected and vetoed the vote, but the councilmen voted to override her veto. As Moya struggled to control the meeting, she stated that she had acted on the firings because that was what the people wanted, and that was why she was elected.